Include an Ozone System for a full Ozone Sauna Experience or use the Hyperthermic Chamber just as a relaxing, rejuvenating, detoxifying steam sauna bath for home or business. The choice is yours! For Home and Business Use. Home owners! Yes you DO have room for a high quality comfortable Steam Sauna in your home! Melt away the stress of the day when you get home after a tough day. The Hyperthermic Chamber needs no formal installation, can be used in any room on any floor surface, no drains; just plug it in, add water, turn it on and it is ready for you in minutes. Enjoy it just as a "Steam Sauna" or choose from one of our "Ozone Sauna" Packages for ultimate steam and ozone benefits. Business owners are always excited to learn that the Hyperthermic Chamber can be used in any room of the office, clinic, or spa, even on wood floors, and can be used as just a "Steam Sauna" or as an "Ozone Sauna" by adding a Longevity Ozone Package. Built specifically with commercial use in mind The Hyperthermic Chamber has been rigorously inspected and tested by an independent 3rd party laboratory inspection company QAI.org (Quality Auditing Institute). Passing all of these inspections with flying colors the Hyperthermic Chamber has been Certified to North American CSA and UL Standards. It is designed and built to run all day long! 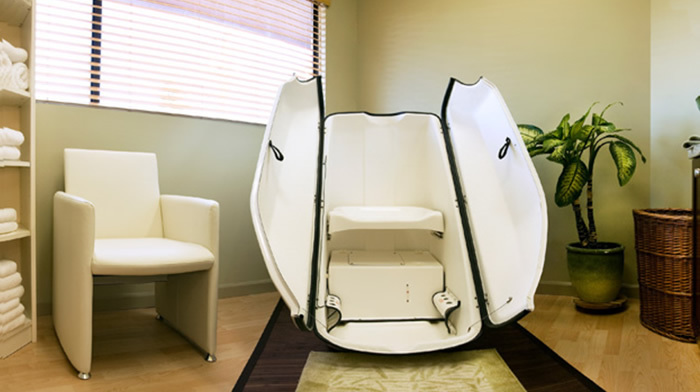 Great profits can be yours as you will see on our "Profits for your Business" page, as the Hyperthermic Chamber leaves your clients to a peaceful steaming experience while you attend to other clients. See the phenomenal features below and you'll be dreaming of the Hyperthermic Chamber tonight! Or just click the button below to connect with Longevity Product Specialists for more information, pricing, and quotations! THE "BEST IN CLASS" STEAM CABINET! We are pleased to provide you with undeniable proof that this product is high quality, reliable, and safe to use. You are looking at products on the internet. Every company says that their products are high quality, and you wonder..."how do I know for sure that this is a Quality product? How do I know if they are telling the truth?" We understand. We we feel the same way when we shop for products on the internet. We know it is hard to blindly trust products are high quality....so we want to earn your trust and help you to feel excited about your purchase of the Hyperthermic Chamber and prove to you, before you buy it, that this is a high quality reliable product that won't let you down. 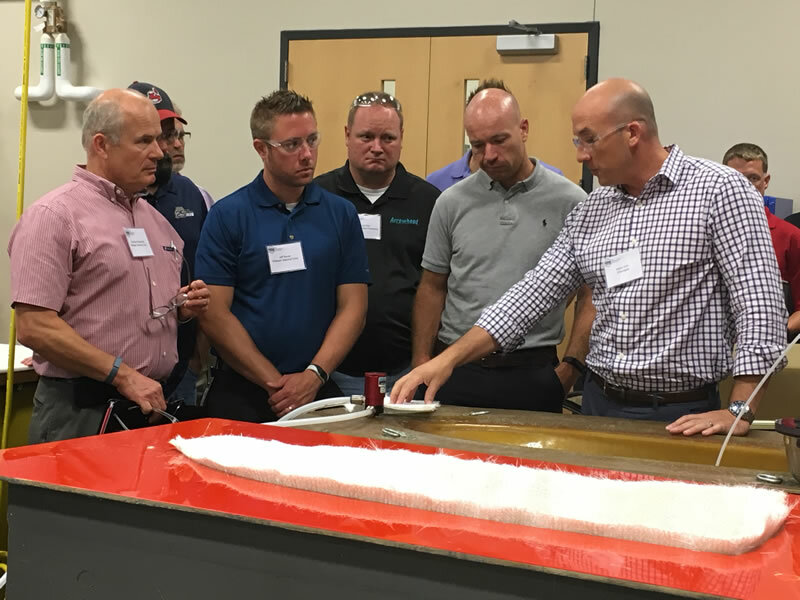 Fortunately, there are companies like QAI.org (Quality Auditing Institute) who can help, independent testing laboratories who will take a product, test it rigorously in the laboratory according to product standards created by CSA (Canadian Standards Association) and UL (Underwriters Laboratories USA) and also fully inspect the factory where it is built. That is exactly what QAI.org does for Longevity Resources Inc., and the Hyperthermic Chamber passed with flying colors. Inspections of all structural materials and components to ensure they were not only safe to use, but would be reliable for many years. Inspections of all electrical components to ensure they abide by the product standards established by CSA and UL. Performed flame and fire tests on the components and structure of the sauna to make sure it was safe to use. Tested the heat tolerances of all electrical components, and the heat that they were actually exposed to, to ensure that they would run reliably for many years. Tested the methods that were used to connect all components together to ensure this too was safe and reliable. Detailed inspections of the factory where the Hyperthermic Chamber is made to ensure Quality Controls are in place, and detailed record keeping, to ensure that all units would be as high quality as the one that was submitted for testing. If a product is high quality and safe to use, the product and factory will receive a passing grade. If the product is not high quality, it fails the testing. The QAI Approval that appears on the side of the Hyperthermic Chamber, is your PROOF that this is a high quality reliable product that will run reliably for many years. No need to get up, no need to exit the sauna! See the TIME remaining in the sauna session AND the Temperature inside the sauna while you are relaxing in the sauna! Adjust the Temperature and Time without leaving the sauna! A digital keypad for entering the TIME you will be in the sauna and also the TEMPERATURE you want to experience is a very convenient feature to have. Longevity has made this feature even MORE CONVENIENT by enabling you to see a constant readout of the time and temperature, from inside the sauna! Why is this unique? While other companies mount their Time and Temperature controls on the side of the sauna where you can't see it and can't adjust it, Longevity provides you with a Remote Control that you can See and Adjust from Inside the Sauna!! Hang the Remote Control on the wall, put on a table top beside you or in front of you, or even put it on the floor in front of you while you sit in the sauna. The great convenience of this is that you can always see the Time remaining in the sauna session and the current inside Temperature of the sauna while remaining comfortably seated inside the sauna. The other great convenience? If you want to change increase or decrease the sauna temperature you can do this without ever leaving your seat! Want to stay in the sauna longer than you had originally programmed? Don't get up, just reach over to the Remote Control and adjust the time and temperature. 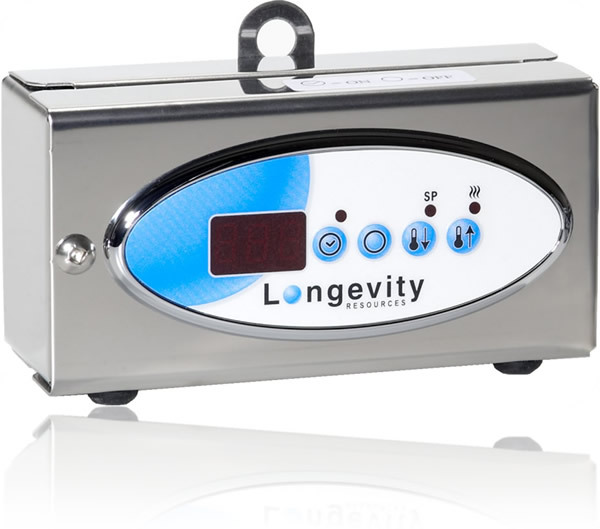 Longevity's hand held Remote Control will allow you to adjust Time and Temperature of the sauna from your seat, greatly enhancing your comfort and enjoyment of your sauna session. 10 Seat Height Adjustments! Ultimate Comfort! Your head protrudes from the top of any Steam Cabinet so that you can breathe the fresh, cool air in the room. This is one of the many reasons why so many people prefer using a "Steam Cabinet" over being fully inside of a "Steam Sauna Room". Breathing cool air adds to the pleasure of the steam bath. The 'industry standard' is to provide only 4 seat positions. Yikes! What are the chances your head and neck will fit comfortably out of that neck opening with only 4 seat height positions?! Longevity realized way back in 1996 when we designed the Hyperthermic Chamber that the only way to have your head in the proper position was to provide LOTS of seat height options. As such, the Hyperthermic Chamber has way over double the amount of seat height options than any other product in this class....10 Seat Height Positions!. You are in the sauna for both health and pleasure. The seat MUST be at the proper height to ensure your head and neck are comfortable. Longevity provides 10 seat height adjustments to ensure that everyone, regardless of body size or shape, will be comfortable inside. Don't settle for the industry standard of 4 seat positions. Yikes! The Hyperthermic Chamber was built to accommodate everyone comfortably! Choose the Hyperthermic Chamber and you will be thrilled! Longevity's Unique "©Surround Steam System" incorporates four (4) independent steam vents, double the industry standard of only 2 steam vents, plus we designed the industry's first steam diverters to protect your feet and create more room in the sauna. With our "Surround Steam System" your time in the Hyperthermic Chamber will be oh so comfortable! It was a cold week in January 1996 when the president of Longevity Resources Inc. spent 3 whole days in his bathing suit, in a cold warehouse, getting into and out of a prototype steam sauna cabinet (while engineers watched) trying to find the perfect number of steam vents and the perfect position of the steam vents. All those years ago we thought this would be a simple task. How hard can it be to introduce steam into a small sauna like that? It turns out....a lot tougher than you'd think!!! We quickly realized that the proper position of the steam vents and the proper number was crucial to the occupant's comfort. Test after Test after Test was required to find the solution, and we finally did. A wrinkled and dehydrated company president found that our (4), not two, steam vents was the magic number. The magic position was two up front on the floor with special steam vents attached to protect the feet, and another two steam vents to project just the right amount of steam up the back of the sauna to "Surround" you with luxurious steam, prevent hot spots, and eliminate cold spots. The unique "Surround Steam System" was born, and to this day exists only in Longevity's Hyperthermic Chamber Steam Sauna Cabinet and Ozone Sauna. More than 20 years later competitors are now copying the floor mounted steam vent systems, but still refuse to spend the extra money to install the back steam vents that are so very important to your comfort. Longevity's Four Steam Vent "Surround Steam System", with special diverters installed, is the key to your comfort and safety when using the Hyperthermic Chamber. We've gone the extra mile with the four steam vents to make doubly sure you are happy and comfortable with every steam! Happy Steaming! WIDE Open and Spacious for your comfort and super easy Entry / Exit. Our Two Doors ensures you have plenty of space to easily Enter and Exit! Each door has 3 thick stainless steel hinges (6 hinges in total) and weighs only 3 pounds! Let's skip back to 1996 again. When Longevity engineers were designing our Hyperthermic Chamber Steam Sauna Cabinet there were 3 other models already on the market that we investigated. Glaringly obvious in those days was the cumbersome nature of a single heavy door opening to only one side and held onto the sauna with just two hinges. Simple common sense (with the help of undeniable physics) dictates that the hinges on only one side of that door would be under tremendous stress of the weight load of the entire door pulling down the opposite side! Also under stress would be the fiberglass body of the sauna itself where the two hinges attach! That huge mass held by only 2 hinges was inexpensive (cheap) construction but caused that big door to sag on the unsupported side in addition to causing damage to the sauna body. Clearly there had to be a better way! Longevity engineers saw an opportunity for improvement that would increase both the Quality of the sauna and the "Ease of Use". Longevity's Double Door System naturally triples the number of hinges to 6 solid high quality stainless steel hinges (3 on each side), and at the same time, cuts in half the weight that each hinge has to carry. One does not have to be a physics expert to realize that doubling the number of hinges while cutting in half the weight of the door increases the quality and durability of the sauna. The additional benefit is a widening of the space provided to Enter and Exit the sauna. Longevity could save lots of money in production if we built a single door...easier and quicker to install, and half the number of hinges. But why would we? Undeniable success with the double door system has proven that since 1996 we have not had a single instance of any doors 'sagging', which based upon the quality of the thick stainless steel hinges, and the light weight of each door..... is not surprising. You will enjoy the Longevity Double Door System and the W-I-D-E Open space it provides for you to enter and exit. The side benefit is the impossibility of any door sag. We guarantee it! 1/ Low Water Sensor: To make sure the Steam Generator never runs completely out of water and to prevent it from overheating. This Low Water Sensor will automatically turn off the Vortex II Steam Generator before it runs out of water preventing damage and ensuring your safety. 2/ Low Water Warning Light: Should your Hyperthermic Chamber run low on water, a Low Water Light will illuminate on the side telling you to add water. Easy, if the light is on it is telling you to add water. Another great and unique feature, is the Water Level Sight Glass that is just behind our model's right foot in the photo to the left. This "Sight Glass" will ensure that you always know how much water is in the Vortex Steam Generator, and when to add more BEFORE you run out of water. Nice. 3/ Secondary Back up High Heat Shut Off: For added safety, we installed a "High Heat Shut Off" which would shut off the Vortex Steam Generator in the unlikely event that Low Water Level Sensor ever failed. This secondary system doubly ensures your safety in the sauna. 4/ Timer Shut Off: Ensuring your safety is the Timer Shut Off which automatically cuts power to the Vortex Steam Generator when the set time elapses. It's nice to know ahead of time, before you even purchase the product, that 3rd Party Inspectors, unrelated to the manufacturer, have inspected the product and found that it passes all of the CSA and UL Product Safety & Quality Standards. We take you and your family's safety seriously. Commercial users looking for a Steam Cabinet and Ozone Sauna for commercial use will have comfort in the fact that the QAI Certification to CSA and UL Product Standards will ensure the safety of your customers, and durability of the product under daily long term commercial use. The Hyperthermic Chamber easily fits into any room of a home, business, spa, or clinic, can be used on any floor surface, needs no drains, no plumbing, no special ventilation, uses little power, and plugs into a standard wall socket. What are you waiting for? Buy now! Have you ever wished you could put a Steam Sauna or an Ozone Sauna into your home, business, clinic, or spa but thought it would be too much trouble, or maybe even impossible, to install? Now you don't have to worry about that. The Hyperthermic Chamber can be used on any floor surface and in any room. Just plug it in and turn it on and you will be relaxing in a wonder of steam at that perfect temperature for you! After your sauna you exit feeling refreshed and clean because the steam constantly bathes you and removes toxins and sweat. Business owners are always excited to learn that you feel so refreshed after being in the Hyperthermic Chamber Steam Sauna that you don't even need to have a shower afterwards! This takes sauna convenience to a whole new level for both Home and Business use. Plus, the fantastic purchase price means everyone and any one can afford to have a steam sauna (or Ozone Sauna) in their home or business. Call or email Longevity today for pricing and more information! We help promote and build your health by manufacturing a Steam Sauna that is VOC free! No harmful emissions! You are buying a product to stay healthy, or perhaps to regain your health. 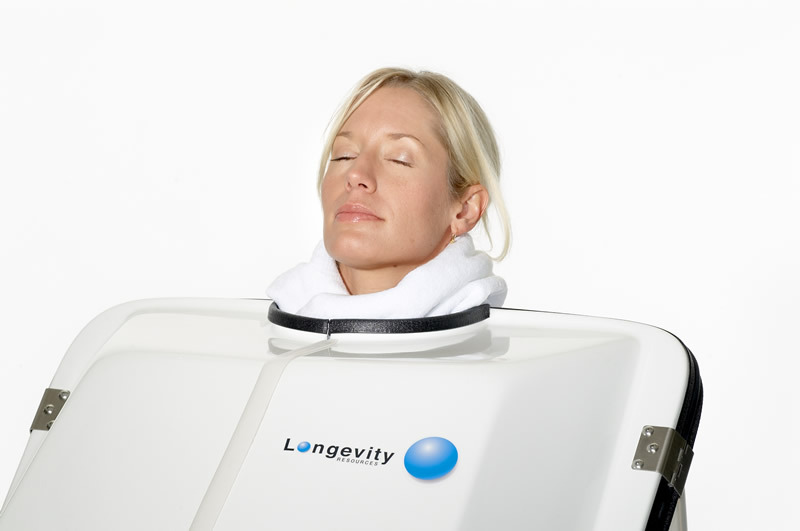 Longevity promotes your health by ensuring we manufacture our Hyperthermic Chamber Steam Sauna Cabinet in a healthy way! => Closed Cavity Vacuum Bag Molding of the fiberglass, also known as Light Resin Transfer Molding (LTRM). Fiberglass is the best product from which to make a Steam Sauna and especially an Ozone Sauna because it is 100% Ozone Resistant, it really is made of a super hard type of glass. Unlike plastic products fiberglass will never deteriorate when in contact with oxygen or ozone. The phenomenal resilience to Ozone ensures our Hyperthermic Chamber will remain rock solid high quality for 20 years and more! How do we know this? Not a single Hyperthermic Chamber has cracked or deteriorated since placed on the market back in 1996!! LTRM means we provide a beautiful smooth exterior and interior surface to the Hyperthermic Chamber Steam Sauna, and no VOC's (Volotile Organic Compounds). The fiberglass is trapped inside a hard exterior surface, both of which are extremely strong and resilient. All of the door seals, both around the doors and between the Double Doors, are also ozone resistant and prevent ozone from escaping from the sauna. A beautiful smooth shiny surface both inside and outside the Hyperthermic Chamber, a wonder to behold! Super Strong, easy to clean and sterilize, and simply a healthier way to manufacture a health product! Enjoy your new Hyperthermic Chamber Ozone Sauna! The Hyperthermic Chamber requires zero regular maintenance, even when used in commercial business operations all day long. Just add water turn it on and enjoy your steaming! Since 1996 Longevity Resources Inc. has provided Hyperthermic Chambers to customers in 90% of the countries around the world. They are literally everywhere! Since the Hyperthermic Chamber is about the size of your average armchair, our engineers wanted to ensure that in the unlikely event that anything were to happen to the electronics, the affected component could be easily and quickly replaced on site. It certainly would not make sense to expect any customers to return the entire sauna for repairs. For that reason, the "Vortex II Steam Generator" that provides the steam for the Hyperthermic Chamber was designed to be 'modular'. This means that in the unlikely event that something were to go wrong, for example from an electrical surge or other unexpected event, any affected module could be easily replaced on site. Access to all modules is available through the Stainless Steel Access panel on the side of the sauna. We expect your Hyperthermic Chamber to function flawlessly for a lifetime. If you were to experience difficulty Longevity staff would decide which module has been affected, and that module would be sent directly to the site of the Hyperthermic Chamber, and easily installed by someone local in a "Plug and Play" fashion. Within moments of arrival of the component, you will be once again happily steaming away in your sauna. The Hyperthermic Chamber Steam Sauna Cabinet, designed as the ultimate Steam Sauna Cabinet for Ozone with all ozone resistant Vortex II Steam Generator, fittings, seals, trim, and enclosure. We're ready....are you? The Hyperthermic Chamber has a 100% Complete Stainless Steel Steam Generator for ultimate ozone resistivity. This 316 Stainless steamer is situated in the bottom of the Hyperthermic Chamber, below the seat, has a sealed boiling chamber where the steam is created and a completely separate electronics compartment. The electronics and controls of the Vortex II Steam Generator in the Hyperthermic Chamber Steam Sauna are isolated from the steam, ozone, and even isolated from the heat! It's true! All electronics will run more reliably for a longer life if they are not exposed to high heat conditions. The electronics that run the Hyperthermic Chamber Steam Sauna Cabinet are self cooling ensuring longevity and reliability! The door hinges (stainless steel), seals, and door trim, are all manufactured from ozone resistant materials. The seal down the middle of the two Double Doors is made from ozone resistant silicone for a tight steam proof seal that will never be affected by heat, steam, oxygen, nor ozone. Again, the Closed Cavity Bag Molding construction of the body of the Hyperthermic Chamber is also 100% Ozone Resistant, VOC free, and smooth and beautiful on both the inside, and the outside. The ideal Steam Sauna Cabinet and Ozone Sauna Systems await you at Longevity Resources Inc. Call us or email for more information, pricing, and with your questions. Specifications and Facts that will WOW You! Hyperthermic Chamber Steam Sauna Cabinet "Specifications"
Hyperthermic Chamber Specifications. Call Longevity Resources Inc. if you need more information! 40" Deep x 28" Wide x 48" High (101.63cm D x 71cmW x 121 cm H) Requires about the same room as a standard 'arm chair'. Fits small rooms, small apartments, small offices / clinics. Longevity's Hyperthermic Chamber won "Number 1 of the Top 10 Products to Have in Your Home" by Askmen.com + #1 Product to Have in Your Home by Balance: TV for Living Well. OPEN WIDE Double Door System with 6 sturdy stainless steel hinges (3 on each door). State of the Art manufacturing makes these doors super strong, yet light as a feather at less than 3 pounds ea. 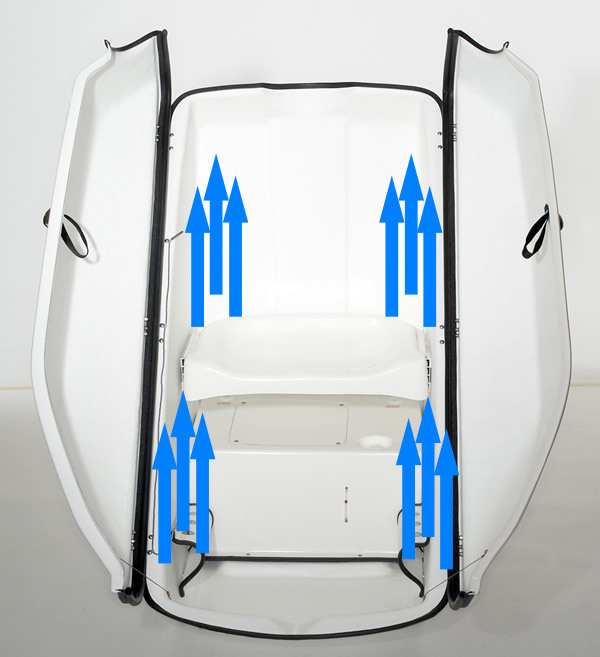 We ship the Hyperthermic Chamber Steam Sauna Cabinet Worldwide on a daily basis. Product is in stock and ready to ship immediately to all worldwide destinations. Order today! 10 height positions ensures optimum neck position, molded formed comfort seat, molded formed comfortable neck opening. Seat will hold up to 400 pounds or 181kgs. Best in Class! 110 pounds or 50 kgs empty. Wheels on back make moving it from room to room extremely easy. Wheels are not in contact with the floor when sauna is occupied. 110 - 120 Volt AC 60 Hz 11.7 Amps. Also 220 - 240 Volt 50 Hz 5.8 amps versions too! Use the Hyperthermic Chamber in any country in the world. Plugs into a regular power outlet on your wall. Hand Held Remote Control chooses digital time and temperature. Internal sensor maintains temperature within 1 degree of set point. Adjust time/temp while seated in the sauna! 316 Sealed Stainless Steel steamer called 'Vortex II Steam Generator' mounted inside the sauna. Separate water tight, cooled compartment for electronics ensures reliability. Can be used in any room on any floor surface (even wood). Requires no installation, no drains, no plumbing, no water lines, plugs into a standard wall socket: specify 120 or 220/240 when order. 5 Year Warranty on the body of the sauna, 2 Year Warranty on electronics. 120 Day Satisfaction Guarantee during which Longevity pays all shipping for components that qualify for warranty replacement. 30 Day Money Back Return Policy. (See details when purchasing). The world's only 4 vent "Surround Steam System" for even delivery of steam, ultimate temperature control, no hot spots, no cold spots. Ultimate comfort, ultimate steam sauna cabinet! Two rear castor wheels contact the floor only when Steam Cabinet is tilted backwards (not in contact with floor when occupied). Makes it as easy to move around as a shopping cart. After more than 20 years in business, Longevity staff have earned a reputation for providing Legendary Customer Support. Friendly staff are always available to help you with your questions about using the Hyperthermic Chamber, no charge, no expiry date...just smiles! Space age technology LRTM (Closed Cavity Molding) produces smooth surface inside and out with no VOC's. Healthy manufacturing for a healthy Hyperthermic Chamber Steam Sauna Cabinet. Easy Fill "mess free" Water Fill Port; no plumbing required. Pour water in up to 6 liters. Water volume shows on site glass so you always know how much water is in the reservoir. Longevity's Product Specialists are not sales agents and don't make commissions. They simply, and sincerely help you to find the right product for your needs, at the right price to fit your budget. Warning: Friendly banter with our staff may result in you laughing and havnig a good time!